When I first returned to Christchurch in 2015 I can remember feeling stunned at the army of orange cones that were standing like sentinels, separating rubble from roads; alerting us to submerged potholes, a beacon of warning at the uneven surface on which they stood. It’s surprising how quickly those cones become part of the persona of a life in Christchurch. On Thursday and Friday this week those cones reminded us of the progress we have made, and the reconstruction yet to happen. The 2018 Canterbury Earthquake Symposium was held at the University of Canterbury, bringing together policy-makers, local and national politicians, planners, academics and even a few Whānau Ora kaimahi . There is no such thing as too much communication. “The single biggest problem in communication is the illusion that it has taken place”. Search out the missing stories…. Undertake further research in this area to ascertain how affiliation, cultural identity, social economic status, gender, age and disability intersect. Kutt Functional Fitness strives to provide an environment that promotes, and provides accessible hauora solutions to whānau. Their aim is to create a space, and product, that provides a safe, nurturing, and challenging connection to all aspects of hauora Māori which can be enjoyed by whanau of all backgrounds. Over 65 individual whanau have participated in the past twelve months and then seventeen new individual whanau in this reporting quarter. We support Phil, Steph and Heperi with a Navigator Tinana agreement that has very clear specifications around the wellbeing of the whānau. Te ao Māori practices are evident at all times; building concepts such as whanaungatanga, manaakitanga and aroha. These values are principles upheld in all aspects of Whānau Ora outcomes. Ka mihi. Kutt Functional Fitness utilises te reo Māori in all sessions, whether that is big or small. Ahakoa he iti, he pounamu! It was a thrill to attend the Te Wai Pounamu Kapa Haka Festival this year, to share the awesome energy of performers, in their sweat, heart and soul for their Maori culture and identity. This year we were delighted to sponsor one of the groups that performed : Te Amokura Kapa Haka Group. Congratulations to our up and coming leaders Aporonia Arahanga (Kai Tahu, Te Arawa, Nga Rauru) and Awatea Pokai (Ngati Rarua) for strong leadership as young mentors for the young performers well done. The intergenerational leadership needs to be acknowledged. Te Amokura had a proud placing of a 3rd place overall for the Te Wai Pounamu Cultural Festival. Arowhenua kaumatua Suzy Waka, also known as Pamela Niles from Arowhenua Papatipu Runaka, has been a health champion for hauora for over 35 years. On 30th October one of our team, Vania Pirini, attended a celebration of her retirement and an acknowledgment of the relentless effort she has generated with accolades showered on her by governance, management work colleagues, and whanau from all backgrounds. Whanau came from afar; the waiata, laughter and aroha a fitting tribute to a wahine toa who has walked her talk amongst us all. We love the effervescent energy; the optimism and the devoted commitment that exudes from Corstorphine Community hub. How proud can everyone at Corstorphine be of the well-deserved recognition they achieved as finalists in the Dunedin Empowering Volunteers community award. 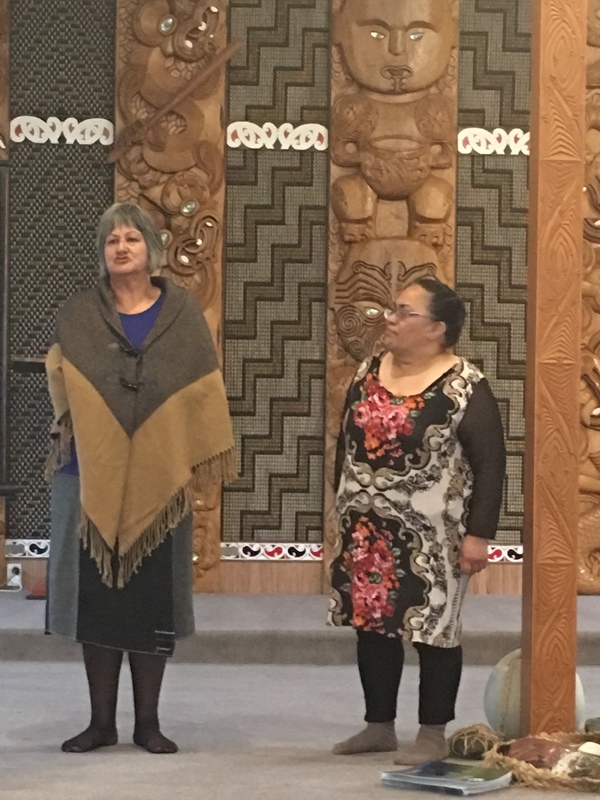 This week, despite being faced with threatened road closures and severe weather warnings, we were honoured to travel with Dame Tariana to the 23rd hui in the Tu Pono series being held at Waikawa Marae in Picton. It was a long day – we left Christchurch at 7am Wednesday and returned 3.30am on Thursday morning – just in time for the earthquake symposium. We wanted to pay our respects at Takahanga to the Kahu whānau in the loss of their dearly loved father and Koko Spencer. All of that journey represents the story of Tu Pono : tears of lament; grief and loss; the unpredictability of the elements; road blocks and mudslides; tumoltuous rain; detours and delays. But love actually – hope and promise, memories to live up to; promises to keep – that’s what it means to keep all our whānau safe and secure. The hui at Waikawa was absolutely powerful. The korero from Dame Tariana set us alight – we must challenge racism within our midst; call out injustice; stand up no matter how uncomfortable that might be. There was much conversation around gangs. Whaea Tariana challenged us that every time we say “that’s the Mongrel Mob or Black power”, we should ask, ‘and who’s kids are they in these gangs? Who do they belong to? That korero inspired and provoked reflections across the whare - There was discussion about those who feel rejected and alienated from their marae. How do we bring our whānau back, the process of restoring the tapu. We need to raise the integrity of our paepae (this was in response to challenges that have been made when whānau members have asked abusers to be removed from the pae, and other whānau members have asked for evidence). 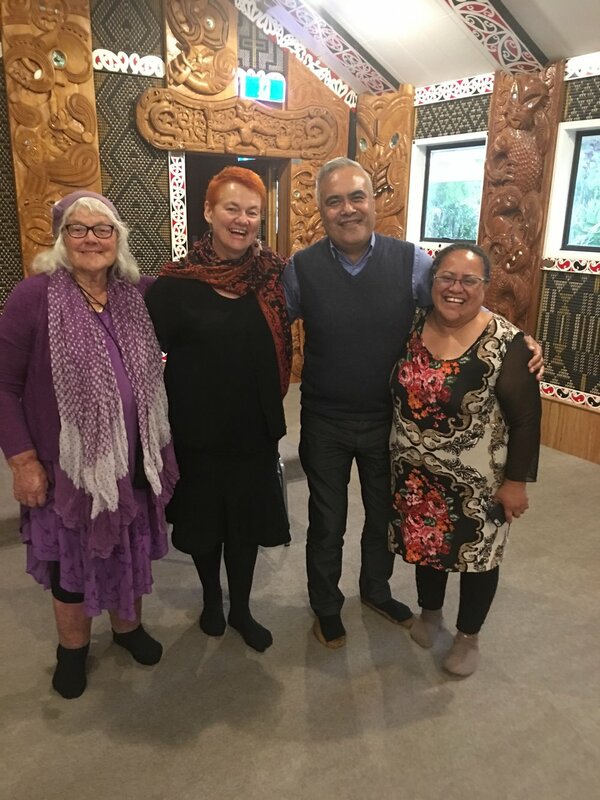 This week Maania Farrar attended a community workshop for Iwi/Māori to help co-create and feed into a National Social Enterprise Strategy for Aotearoa. What does Social Enterprise/Pakihi Whai Kaupapa mean to you? What are the opportunities and opportunities that Iwi/Māori Social Entrepreneurs see in front of them? What support do Maori Social Entrepreneurs and enterprises need to thrive? Is there a need for a National Iwi/Māori Social Enterprise Strategy/National Voice on Social Enterprise? On Thursday night, Rāwā Karetai and I attended the inaugural LGBTI Awards ceremony in Auckland. The New Zealand LGBTI Awards brings together community leaders, supporters and allies to celebrate role models for the LGBTI (lesbian, gay, bisexual, transgender, intersex) community. The LGBTI Awards honour organisations and individuals whose dedication to LGBTI equality stands out from the crowd. Mental health issues and suicide disproportionately affect the LGBTI community. The profile of the awards creates role models for young people and gives them hope for successful, happy futures. 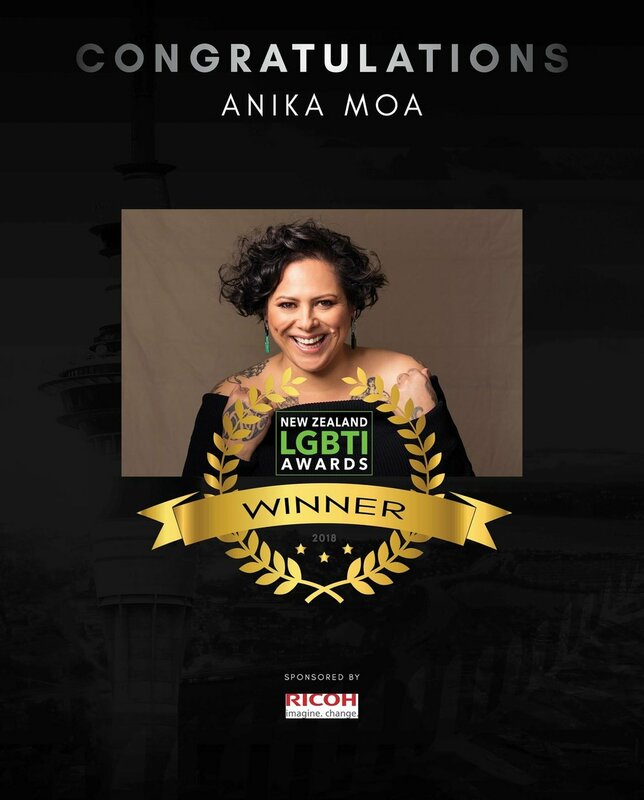 Key award winners on the night were the Lifetime Achievement Award: Jools and Linda Topp (The Topp Twins); Anika Moa (Music Artist of the year) and politician of the year – Louisa Wall. I was asked to present the Takatāpui Role Model of the Year which went to Dr Elizabeth Kerekere. It was heartening to attend Te Pō Whakanui this week to celebrate and acknowledge the tauira and the rangatahi from Te Ora Hou for 2018. The extent of the different programmes is very impressive : Mana wahine; Te Pihi Ora; Whakapakari (leadership); Taiohi Tu; Polyphony. A particular highlight of the evening was to hear of the transformation shared by the Conrad whanau – with their nine wonderful tamariki mokopuna. 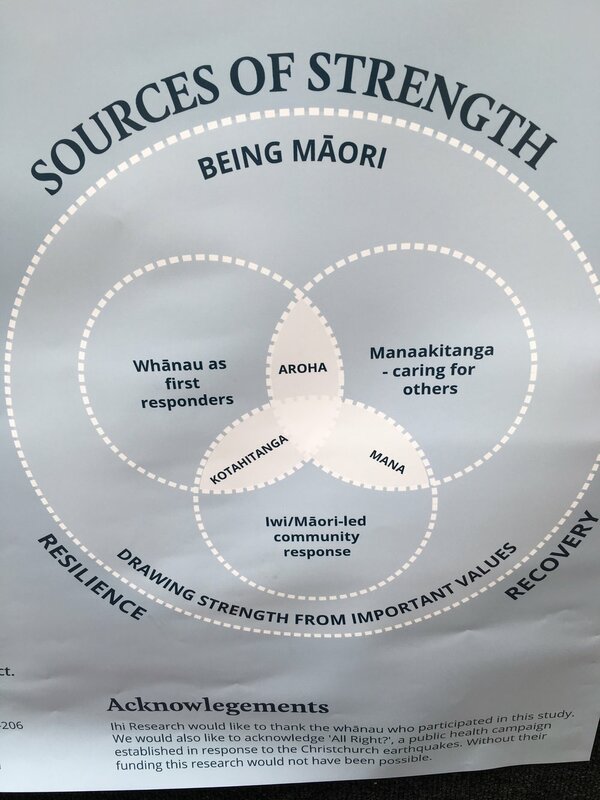 Te Rūnanga on Ngā Maata waka for earthquake response – Linda Ngata coordinates connections via five navigators for 239 households in Hurunui, Kaikōura and Marlborough. Ārai te Uru Hauora in Dunedin for Family Violence. 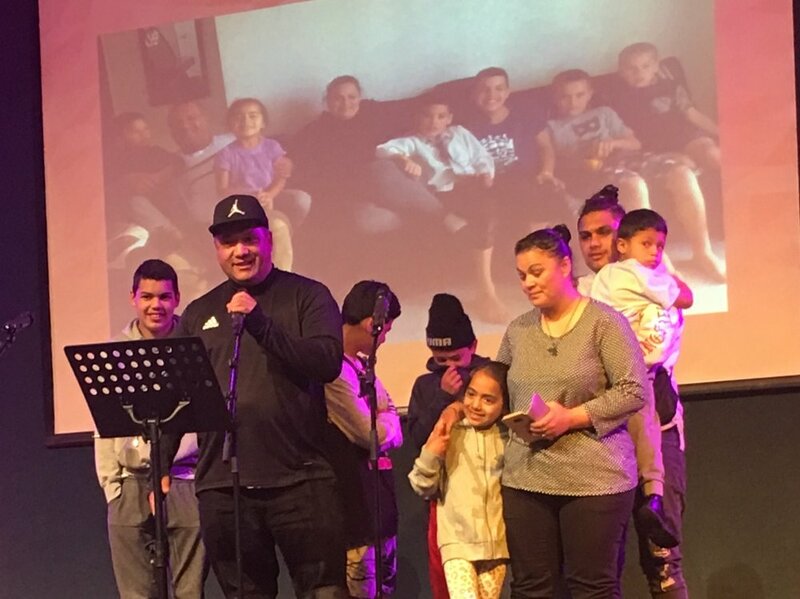 The Whānau Ora Connectors for Te Waipounamu – and their supporters!